How quickly has 12 months gone? If you’re getting ready to head back to work and your little one is getting big enough to start their first day in childcare why not take a moment and look back on the amazing 12 months you’ve had together and celebrate it. Make a date to have some awesome photographs that will record this first major milestone. Their first year is an amazing time in both your lives. They have grown and changed faster than you ever imagined possible. And here it is, their very first birthday. Let me help you create beautiful memories of this amazing time. 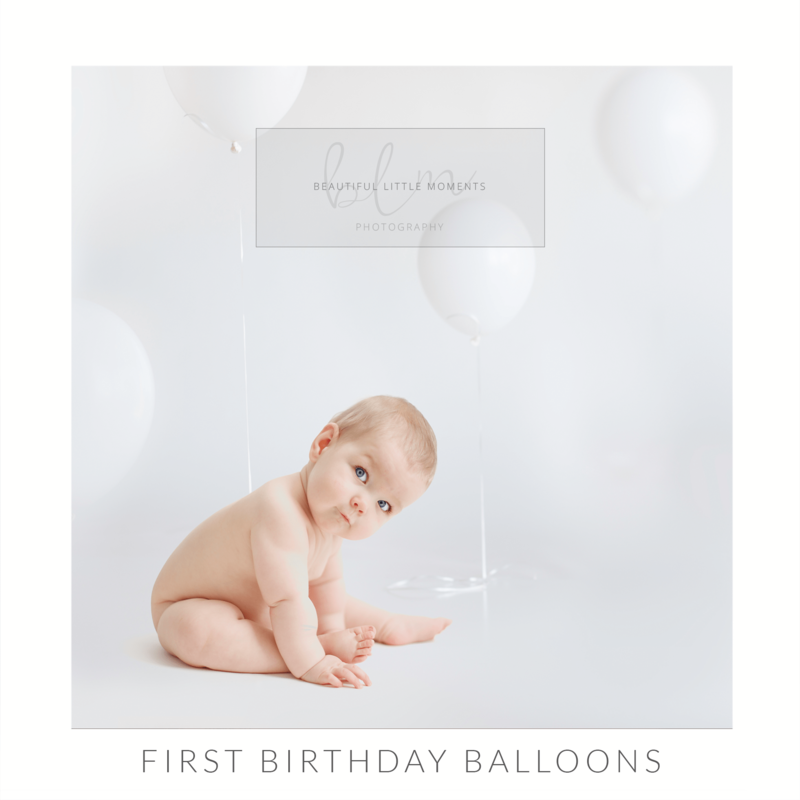 I fully customise your birthday session so it is personal to your little one. From the colours to the backdrop and the props. 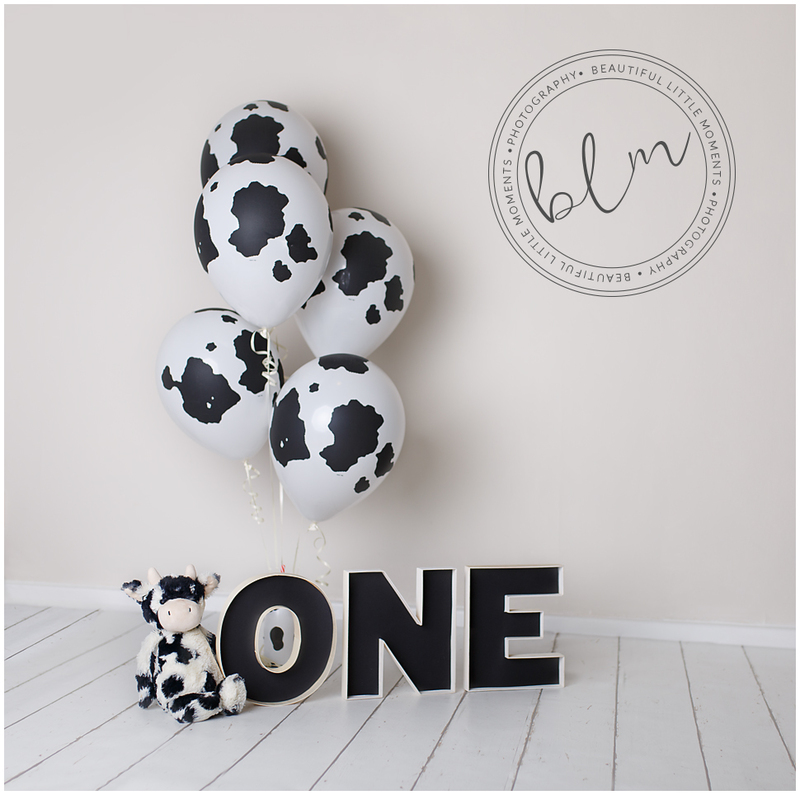 If you want cow print balloons as a reminder of their favourite molly moo or you want helium balloons in the colours of his first babygrow then we can do that. We can design a set around a favourite teddy or toy. Or if your little one loves to splash we can have a bath! Please get in touch with your ideas. I would love to hear all about them and help you make them a reality. Let’s create beautiful images which you can keep forever as a reminder of this special time. To give you flexibility over what you’d like to purchase you can choose which products you would like to buy after your session at your view & order appointment. Choose either classic natural set up or a themed party set. Session fees include my time and expertise preparing, photographing and editing your portraits. My session fees don’t include any products or digital images on USB, this allows you the flexibility of choosing how much you’d like to purchase. Digital images and products can be purchased at your View & Order Appointment. pick your own individual products, prints and digital images from the list below. On average parents spend around £285-435 on their products, prices start from £75. Once I’ve received your details I will get back to you with available dates and we can get you booked into my diary!